In July, the World Bank Group (WBG) released its Energy Directions paper, in which the Bank pledged to limit coal lending to rare circumstances – only in countries with no feasible alternatives to coal. In order for this pledge to have any significance, the World Bank must immediately reverse its active support for massive coal developments in Indonesia. 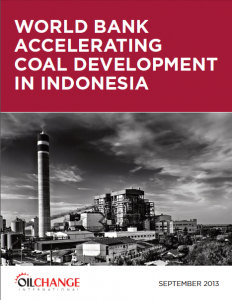 The World Bank’s infrastructure program in Indonesia stipulates policies and government subsidies that promote the accelerated development of over 16 GW of coal power projects in the country ahead of developing feasible renewable alternatives. The World Bank-created and financially backed Indonesia Infrastructure Guarantee Fund (IIGF) awarded its first government guarantee of US$33.9 million to the Central Java Power Project, a 2000 MW ultra-super critical coal plant. The Bank states that the guarantee is critical for obtaining long-term infrastructure finance. Moreover, the WBG served as the transaction advisor to this mega coal project, in which role the Bank arranged financing for the project, promoted the project to investors, and supported the project’s expansion to become one of the largest coal plants in Southeast Asia. This huge coal project has incited strong local opposition including a lawsuit and multiple protests by thousands of local residents resulting in violent clashes with project security and the military. There is still time for the World Bank to do the right thing and halt this dirty coal project as well as further WBG support of coal development more generally. • Renounce support for the Central Java Power Project and insist the Government of Indonesia cancel the guarantee extended to the project. • Stipulate that the World Bank-initiated infrastructure investment tax exemptions and government-provided guarantees and financing do not apply to any fossil fuel projects. • Assist the Government of Indonesia to prioritize the development of alternatives, including significant geothermal resources, ahead of fossil fuel projects. • Ensure that the limit on coal financing in the Energy Directions paper is comprehensive and applies to all forms of World Bank Group support, including development policy loans, financial intermediaries, and advisory services. This coal plant will devastate Indonesia and its environment and it is completely unnecessary. The World Bank should be helping move Indonesia into a renewable energy future. Please do the right thing and make the right decision for everyone.